Ellen Barrow was born circa 1848 at Little Bolton. She appeared on the 1871 Census in 29 Watery Lane, Sutton, St Helens, Lancashire, and Richard Barrow, Nathan? Barrow, Mary Ann Barrow and James Barrow were living in the same household; Richard the head was described as a labourer, as were the rest of the family. Nathan? Barrow was born circa 1853 at, St Helens, Lancashire, . He appeared on the 1871 Census in 29 Watery Lane, Sutton, St Helens, Lancashire, and Richard Barrow, Ellen Barrow, Mary Ann Barrow and James Barrow were living in the same household; Richard the head was described as a labourer, as were the rest of the family. 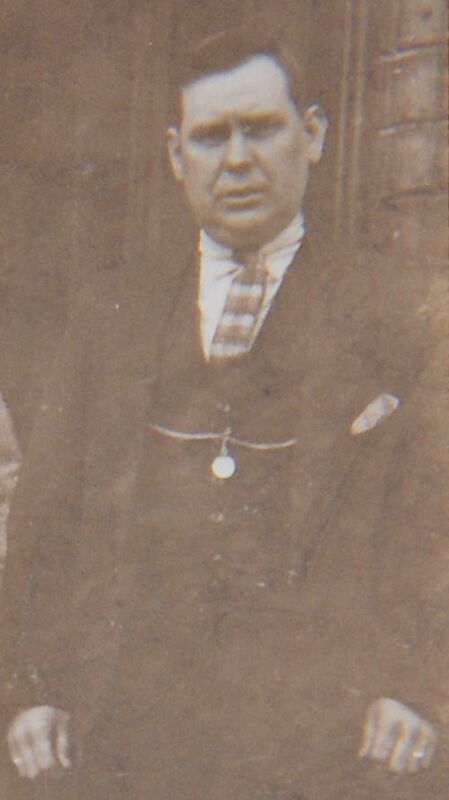 James Barrow was born circa 1859 at, St Helens, Lancashire, . He appeared on the 1871 Census in 29 Watery Lane, Sutton, St Helens, Lancashire, and Richard Barrow, Ellen Barrow, Nathan? Barrow and Mary Ann Barrow were living in the same household; Richard the head was described as a labourer, as were the rest of the family. James Barrow appeared on the 1881 Census in Chancery Lane Cloggers Shop, Parr, St Helens, Lancashire, and Richard Barrow, Mary Ann Barrow and Richard Barrow were living in the same household; James was the head and was described as a clogger, his father Richard, a widow, was a general labourer, Mary was a housekeeper, a nephew to James was also present - Richard. Also in the household was a boarder John Hampten, a foreman shunter on the railway. James Barrow witnessed the marriage of Henry Chaulk and Mary Ann Barrow on 28 June 1882 at Parr, St Helens, Lancashire; At the time of the marriage Henry was working as a labourer and both he and his bride gave their place of residence as Parr. Her married name was Morris. Mary Peel was born circa 1834 at, St Helens, Lancashire, . She married James Morris, son of Thomas Morris and Anne Lowe. Mary Peel appeared on the 1861 Census in, St Helens, Lancashire, , and James Morris, Elizabeth Morris, Ellen Morris and Thomas Morris were living in the same household; James the head was a blacksmith. Also lodging with the family were a charwoman Margery Witon(?) and her daugther Mary Ellen. At this time James' father was living next door. Elizabeth Morris was born circa 1855 at, St Helens, Lancashire, . She appeared on the 1861 Census in, St Helens, Lancashire, , and James Morris, Mary Peel, Ellen Morris and Thomas Morris were living in the same household; James the head was a blacksmith. Also lodging with the family were a charwoman Margery Witon(?) and her daugther Mary Ellen. At this time James' father was living next door. Ellen Morris was born circa 1856 at, St Helens, Lancashire, . She appeared on the 1861 Census in, St Helens, Lancashire, , and James Morris, Mary Peel, Elizabeth Morris and Thomas Morris were living in the same household; James the head was a blacksmith. Also lodging with the family were a charwoman Margery Witon(?) and her daugther Mary Ellen. At this time James' father was living next door. 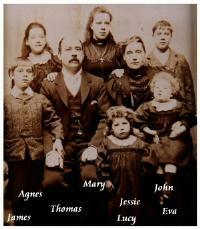 Thomas Morris married Jessie Shingler on 31 October 1881 at St Bedes RC Church, Widnes, Lancashire. 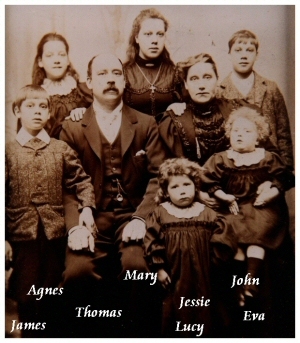 Thomas Morris appeared on the 1891 Census in 38 Gladstone Street, Widnes, Lancashire; Thomas, the head was a fitter and there was a boarder living with the family by the name of Joseph Carr, a moulder born in Sutton. Thomas Morris died on 26 December 1925 at age 68. Marriage* He married Jessie Shingler on 31 October 1881 at St Bedes RC Church, Widnes, Lancashire. Her married name was Morris. Alice (?) was born circa 1854 at St Helens, Lancashire. She married William Morris, son of Thomas Morris and Anne Lowe. Alice (?) appeared on the 1881 Census in 79 Bold Road, Sutton, St Helens, Lancashire, and William Morris, Annie Morris, Thomas Morris and Elizabeth Morris were living in the same household; William, the head gave his occupation as a blacksmith. William was living just round the corner from his father and brother in law Daniel Hardman who lived on Hills Moss Lane. Annie Morris was born circa 1877 at St Helens, Lancashire. She appeared on the 1881 Census in 79 Bold Road, Sutton, St Helens, Lancashire, and William Morris, Alice (? ), Thomas Morris and Elizabeth Morris were living in the same household; William, the head gave his occupation as a blacksmith. William was living just round the corner from his father and brother in law Daniel Hardman who lived on Hills Moss Lane. Thomas Morris was born circa 1878 at St Helens, Lancashire. He appeared on the 1881 Census in 79 Bold Road, Sutton, St Helens, Lancashire, and William Morris, Alice (? ), Annie Morris and Elizabeth Morris were living in the same household; William, the head gave his occupation as a blacksmith. William was living just round the corner from his father and brother in law Daniel Hardman who lived on Hills Moss Lane. Elizabeth Morris was born circa 1880 at St Helens, Lancashire. She appeared on the 1881 Census in 79 Bold Road, Sutton, St Helens, Lancashire, and William Morris, Alice (? ), Annie Morris and Thomas Morris were living in the same household; William, the head gave his occupation as a blacksmith. William was living just round the corner from his father and brother in law Daniel Hardman who lived on Hills Moss Lane. William Henry Chaulk was born on 23 February 1879 at St Helens, Lancashire. He appeared on the 1881 Census in 60 Watery Lane, Sutton, St Helens, Lancashire, and Thomas Chaulk and Elizabeth Catherine Williams were living in the same household; Thomas the head was described as a carter. 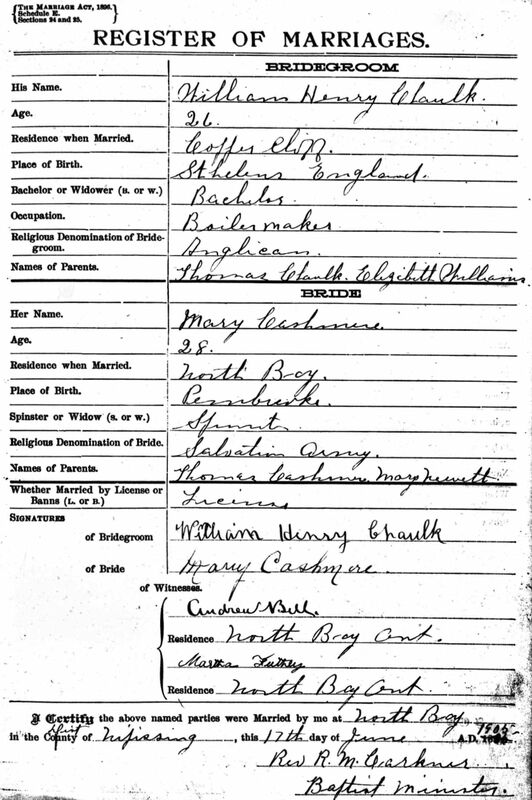 William Henry Chaulk appeared on the 1901 Census in 24 Church Street, St Helens, Lancashire, and Thomas Chaulk, Elizabeth Catherine Williams, Mary Elizabeth Chaulk, Jane Ellen Chaulk, Christopher Chaulk, Emily Blanche Chaulk, Annie Chaulk, Maggie Chaulk, Charles Harold Anderson Chaulk and Thomas Chaulk were living in the same household; Thomas was described as a platelayer (railway), William a boilermaker and Mary a waggon sheet ringer. Beverley Craig the granddaughter of William Henry Chaulk writes " William came to Canada in 1904, he went to Montreal first, stayed a few months, and then moved to North Bay which is 100 km from Sudbury. He moved to Copper Cliff which is now part of Sudbury but at the time was an INCO mining town about 30 km from Sudbury. 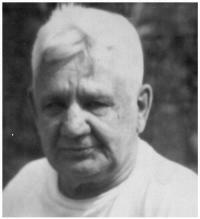 He worked at INCO as a boilermaker until he retired in 1944. He belonged to the United Church, was a good curler and a family man. William Henry Chaulk married Mary Ann Cashmore, daughter of George Cashmore and Elizabeth Reddy, on 17 June 1905 at North Bay, Nipissing, Ontario, Canada; William was resident at Coppercliff and Mary at North Bay at the time. William was a boilermaker and interesting statement of the time is that there is no space on the register to request the occupation of the spouse. William was Anglican and Mary Salvatiion Army. 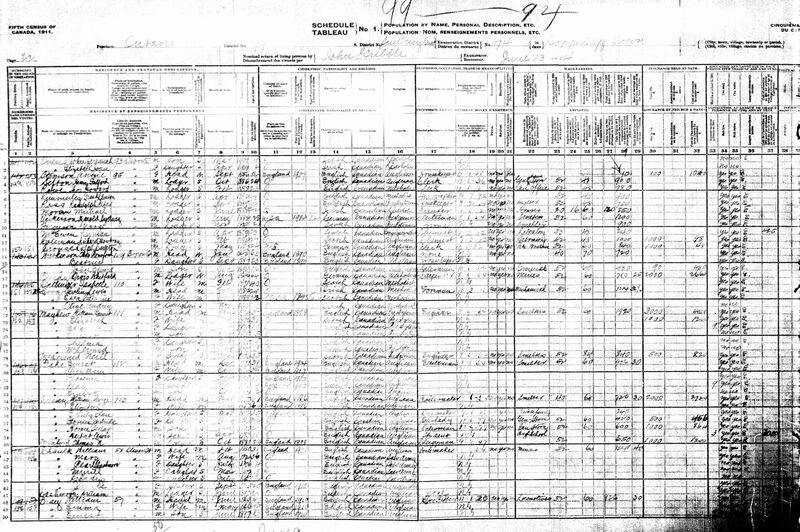 William Henry Chaulk appeared on the 1911 Census in, Sudbury, Ontario, , Canada, and Jane Ellen Chaulk, Mary Ann Cashmore, Pearl Chaulk, Gladys Mae Chaulk and William Ernest Cashmore were living in the same household; William was a boilermaker in the mines and earned $1248 in the year working a 60 hour week for 40c per hour. Jennie, William's sister was staying with them at the time, and a lodger was William Cashmore who Jennie later married. William Henry Chaulk died in 1954 at Sudbury, Ontario, Canada. He was buried in 1954 at Sudbury Churchyard, Canada. Marriage* He married Mary Ann Cashmore, daughter of George Cashmore and Elizabeth Reddy, on 17 June 1905 at North Bay, Nipissing, Ontario, Canada; William was resident at Coppercliff and Mary at North Bay at the time. William was a boilermaker and interesting statement of the time is that there is no space on the register to request the occupation of the spouse. William was Anglican and Mary Salvatiion Army. Her married name was Fountain. 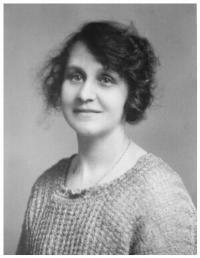 Mary Elizabeth Chaulk was born on 10 June 1883 at, St Helens, Lancashire, . She appeared on the 1891 Census in 34 Church Street, St Helens, Lancashire, and Thomas Chaulk, Elizabeth Catherine Williams, Jane Ellen Chaulk and Christopher Chaulk were living in the same household; Thomas was described as a platelayer. Some of the other young children are absent from the address on this census. Mary Elizabeth Chaulk appeared on the 1901 Census in 24 Church Street, St Helens, Lancashire, and Thomas Chaulk, Elizabeth Catherine Williams, William Henry Chaulk, Jane Ellen Chaulk, Christopher Chaulk, Emily Blanche Chaulk, Annie Chaulk, Maggie Chaulk, Charles Harold Anderson Chaulk and Thomas Chaulk were living in the same household; Thomas was described as a platelayer (railway), William a boilermaker and Mary a waggon sheet ringer. Mary Elizabeth Chaulk married Arthur William Fountain, son of Alfred Fountain and (?) (? 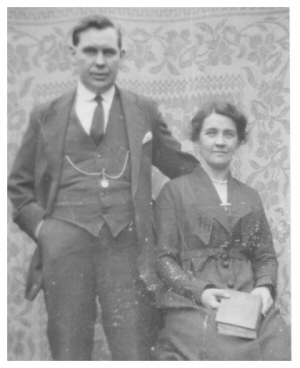 ), on 9 April 1910 at, St Helens, Lancashire, , and the ceremony was witnessed by Jonathon Robert Almond and Jane Ellen Chaulk; Mary lived at 104 Peckers Hill Road at the time of the marriage, and Arthur was a collier. Mary Elizabeth Chaulk died on 19 May 1935 at 116 Pecker Hill Rd, St Helens, Lancashire, at age 51. She was buried on 23 May 1935 at, St Helens, Lancashire, . Marriage* She married Arthur William Fountain, son of Alfred Fountain and (?) (? ), on 9 April 1910 at, St Helens, Lancashire, , and the ceremony was witnessed by Jonathon Robert Almond and Jane Ellen Chaulk; Mary lived at 104 Peckers Hill Road at the time of the marriage, and Arthur was a collier. Jane Ellen Chaulk was also known as Jennie. Her married name was Cashmore. She was born on 16 September 1885 at, St Helens, Lancashire, . 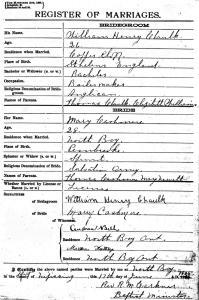 She appeared on the 1891 Census in 34 Church Street, St Helens, Lancashire, and Thomas Chaulk, Elizabeth Catherine Williams, Mary Elizabeth Chaulk and Christopher Chaulk were living in the same household; Thomas was described as a platelayer. Some of the other young children are absent from the address on this census. Jane went out to Canada to look after William Chaulk's ( #257 ) children. Jane Ellen Chaulk appeared on the 1901 Census in 24 Church Street, St Helens, Lancashire, and Thomas Chaulk, Elizabeth Catherine Williams, William Henry Chaulk, Mary Elizabeth Chaulk, Christopher Chaulk, Emily Blanche Chaulk, Annie Chaulk, Maggie Chaulk, Charles Harold Anderson Chaulk and Thomas Chaulk were living in the same household; Thomas was described as a platelayer (railway), William a boilermaker and Mary a waggon sheet ringer. Jane Ellen Chaulk witnessed the marriage of Arthur William Fountain and Mary Elizabeth Chaulk on 9 April 1910 at, St Helens, Lancashire, ; Mary lived at 104 Peckers Hill Road at the time of the marriage, and Arthur was a collier. 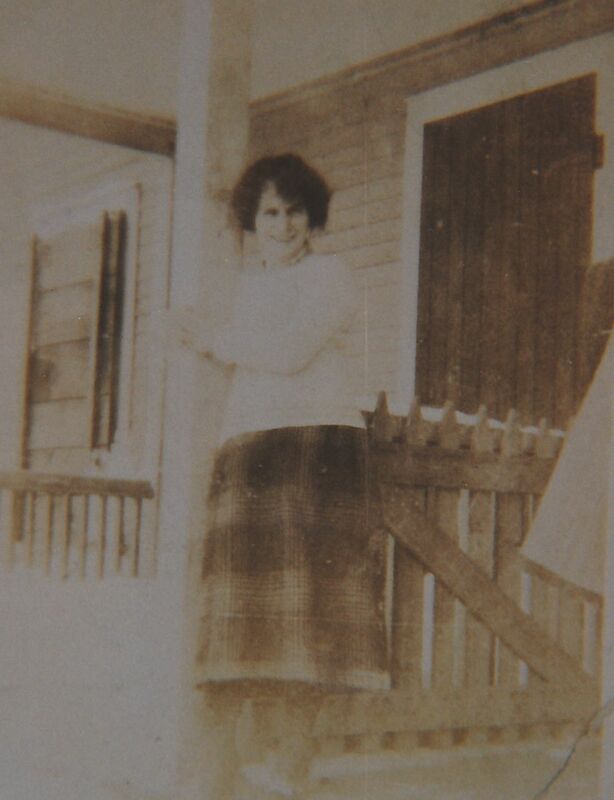 Jane Ellen Chaulk emigrated on 2 July 1910 from, ; Jennie stated she was staying with her brother a boilermaker in Coppercliff. 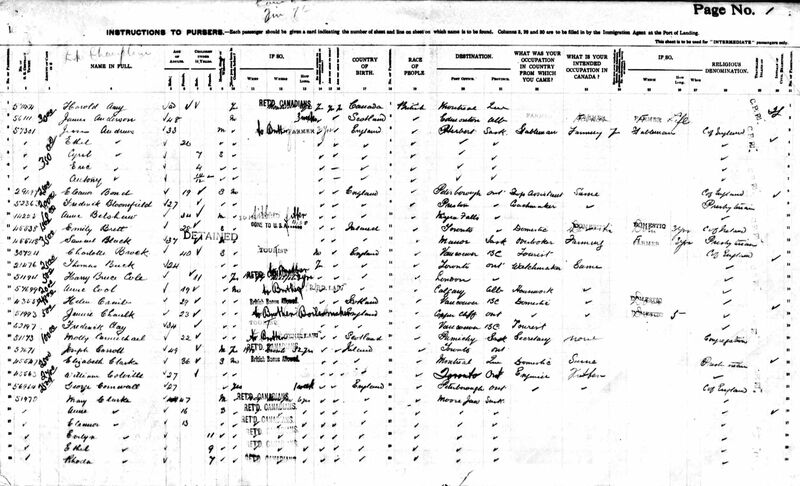 She appeared on the 1911 Census in, Sudbury, Ontario, , Canada, and Mary Ann Cashmore, Pearl Chaulk, Gladys Mae Chaulk, William Henry Chaulk and William Ernest Cashmore were living in the same household; William was a boilermaker in the mines and earned $1248 in the year working a 60 hour week for 40c per hour. Jennie, William's sister was staying with them at the time, and a lodger was William Cashmore who Jennie later married. Jane Ellen Chaulk married William Ernest Cashmore on 5 August 1911 at Cobden, Ontario, Canada. 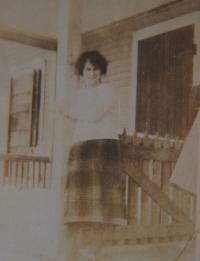 Jane Ellen Cashmore witnessed the marriage of Charles Harold Anderson Chaulk and Lena May Cashmore on 23 October 1926 at, Sudbury, Ontario, , Canada; Charles was a pipe fitter and Lena May a housekeeper. Jane Ellen Chaulk died on 29 October 1960 at Sudbury, Ontario, Canada, at age 75. She was buried at Parklawn Cemetary, Sudbury, Ontario, Canada. Marriage* She married William Ernest Cashmore on 5 August 1911 at Cobden, Ontario, Canada. Christopher Chaulk was born on 21 November 1890 at, St Helens, Lancashire, . He appeared on the 1891 Census in 34 Church Street, St Helens, Lancashire, and Thomas Chaulk, Elizabeth Catherine Williams, Mary Elizabeth Chaulk and Jane Ellen Chaulk were living in the same household; Thomas was described as a platelayer. Some of the other young children are absent from the address on this census. Christopher Chaulk appeared on the 1901 Census in 24 Church Street, St Helens, Lancashire, and Thomas Chaulk, Elizabeth Catherine Williams, William Henry Chaulk, Mary Elizabeth Chaulk, Jane Ellen Chaulk, Emily Blanche Chaulk, Annie Chaulk, Maggie Chaulk, Charles Harold Anderson Chaulk and Thomas Chaulk were living in the same household; Thomas was described as a platelayer (railway), William a boilermaker and Mary a waggon sheet ringer. Christopher Chaulk married Adelaide (?). In the absent voters roll for 1918-1919 in St Helens Christoper Chaulk is recorded at 104 Peckers Hill Road. His army number is given as 42110 Pte 6th Lancs Reg. This corresponds to the details on the rear of a photo of his mother except the number is 142110 the photo also has the address No.4 Coy, 8 Dept, Diala Cmp, Bangalore, S. India. Christopher is also recorded as being awarded a campaign medal in the medal rolls 194-1920. 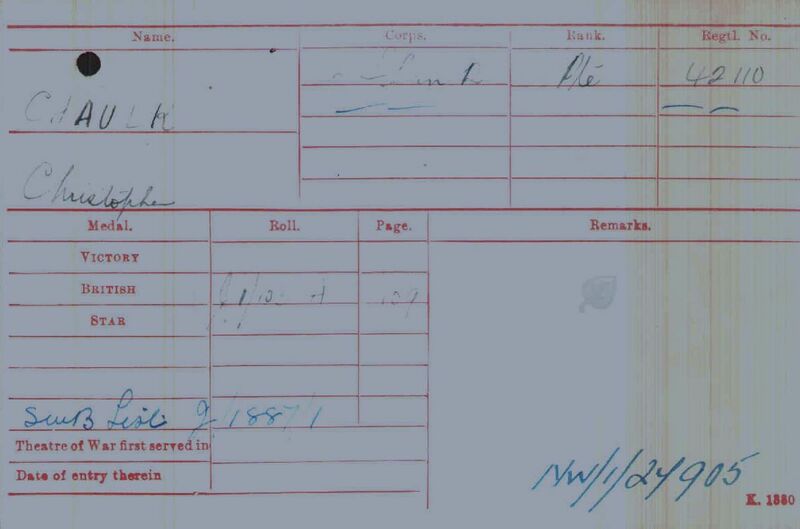 A Charles Harold Anderson Chaulk also appears on the same list at 104 Peckers Hill Road, he is Pte 121039 RFC. Christopher also appears on the roll for 1920 as does Charles H A who is still absent. Christopher is believed by Minnie #205 to have lived in Leigh at some time at Cooke St. On rear of a photo of him 12 Cook St. is written. According to Vi Fountain Chris went out to Canada but came back. Christopher Chaulk worked as a dustman. William Black was born circa 1872 at, St Helens, Lancashire, . He appeared on the 1881 Census in 30 Fenneys Lane, Sutton, St Helens, Lancashire, and John Black, Elizabeth Dearden, Margaret Black, George Black and Mary Ann Black were living in the same household; John the head was a loco driver. It appears that Fenneys Lane was previously known as Mount Pleasant. William Black appeared on the 1891 Census in, St Helens, Lancashire, , and John Black, Elizabeth Dearden, Margaret Black, George Black, Mary Ann Black and Annie May Black were living in the same household; John the head was described as a railway engine driver, William a clerk, Margaret a dressmaker, George an apprentice fitter. Margaret Black was born circa 1874 at, St Helens, Lancashire, . She appeared on the 1881 Census in 30 Fenneys Lane, Sutton, St Helens, Lancashire, and John Black, Elizabeth Dearden, William Black, George Black and Mary Ann Black were living in the same household; John the head was a loco driver. It appears that Fenneys Lane was previously known as Mount Pleasant. Margaret Black appeared on the 1891 Census in, St Helens, Lancashire, , and John Black, Elizabeth Dearden, William Black, George Black, Mary Ann Black and Annie May Black were living in the same household; John the head was described as a railway engine driver, William a clerk, Margaret a dressmaker, George an apprentice fitter. 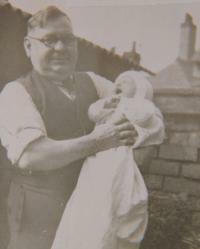 George Black was born circa 1875 at, St Helens, Lancashire, . He appeared on the 1881 Census in 30 Fenneys Lane, Sutton, St Helens, Lancashire, and John Black, Elizabeth Dearden, William Black, Margaret Black and Mary Ann Black were living in the same household; John the head was a loco driver. It appears that Fenneys Lane was previously known as Mount Pleasant. George Black appeared on the 1891 Census in, St Helens, Lancashire, , and John Black, Elizabeth Dearden, William Black, Margaret Black, Mary Ann Black and Annie May Black were living in the same household; John the head was described as a railway engine driver, William a clerk, Margaret a dressmaker, George an apprentice fitter. George Black appeared on the 1901 Census in, St Helens, Lancashire, , and John Black, Elizabeth Dearden, Annie May Black, Elizabeth Black and Mary Ann Black were living in the same household; John the head was a railway engine driver, William was a railway clerk, George a steam engine maker turner, Mary and Annie were assistant school mistresses. 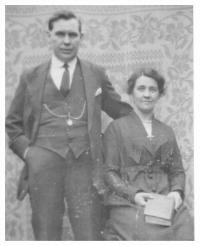 Annie May Black was born circa 1882 at, St Helens, Lancashire, . She appeared on the 1891 Census in, St Helens, Lancashire, , and John Black, Elizabeth Dearden, William Black, Margaret Black, George Black and Mary Ann Black were living in the same household; John the head was described as a railway engine driver, William a clerk, Margaret a dressmaker, George an apprentice fitter. Annie May Black appeared on the 1901 Census in, St Helens, Lancashire, , and John Black, Elizabeth Dearden, George Black, Elizabeth Black and Mary Ann Black were living in the same household; John the head was a railway engine driver, William was a railway clerk, George a steam engine maker turner, Mary and Annie were assistant school mistresses.